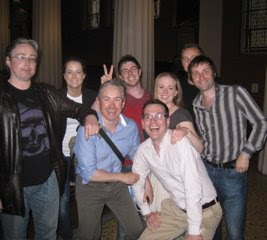 Composer and arranger Michael McGlynn (under the V for Victory sign) came with members of his group Anuna. We were really thrilled finally to see Michael on his own turf - we've been singing his arrangement of Dulaman for a long time, and he composed the Agnus Dei of the new mass (And On Earth Peace) we commissioned and recorded a few years ago. Our first visit to Ireland seemed long overdue - and we'll probably be really sorry to leave. The audiences so far have been so warm and enthusiastic - we still have a master class tomorrow night with the Mornington Singers, and our run out to Wexford on Tuesday to look forward to.